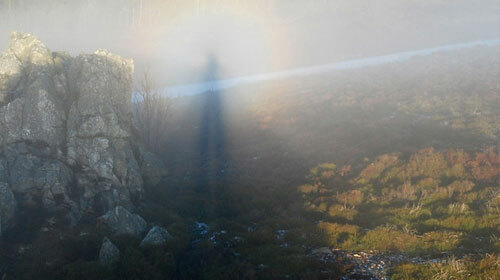 The Fear Liath or also known as the Big Grey Man is an entity reported to lurk on the mountain of Ben MacDui in Scotland. Encounters with this enigmatic creature range from the 1800’s to the present day and vary from reports of an eerie presence to sightings of a large humanoid figure. Reports on encounters with the Fear Liath detail a number of eerie effects that have literally haunted hikers for decades. Most accounts of the Fear Liath come in the form of a presence rather than an actual sighting, this presence is associated with extreme fear and depression and can often send mountaineers into panic without warning. 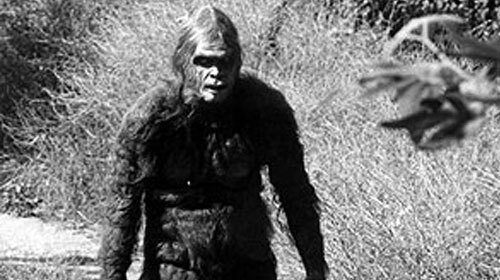 Only a handful of reports deal with physical sightings of the Fear Liath which is described as a large hairy humanoid not unlike legends of the Bigfoot, Sasquatch or Yeti. The Fear Liath is said to be of a muscular build and covered from head to toe in in dark hair with long slender fingers. The more interesting aspect of these encounters with the Fear Liath is the altered state of mind that is said to accompany its arrival. The presence of the Fear Liath has been reported more so than that of a physical sighting with witnesses describing a sudden unease creeping over them often followed by unfathomable fear or extreme panic. One such story is that of John Collie who climbed to the summit of Ben MacDui alone in 1890. John reported that after some time near the summit he began to hear off beat footsteps for every few steps he took and he described these ‘footsteps’ as a ‘crunching’ sound. After John realized the sound wasn’t his footsteps he tried to find the source but couldn’t pinpoint the source of the sound due to dense mountain fog, John was then stricken with uncontrollable panic and ran for what he believes could have been anywhere up to 5 miles before calming down. John isn’t alone in this experience, other witnesses have felt the same fear and some even claim to have turned to see a large grey before turning and running. The presence of the Fear Liath is even believed to have been the cause of a handful of ‘suicides’ in the area. Footprints have allegedly been found on Ben MacDui bearing striking similarities to footprint casts believed to be from the Bigfoot. Is the Broken Spectre illusion the explanation? Interesting the footprints are not the only similarities between stories of the Fear Liath, Bigfoot and Sasquatch as some reported encounters with the Bigfoot and Sasquatch detail an inexplicable fear or unease which is said to grip the witness for no apparent reason which leads some cryptozoologists to believe that these creatures, if they do exist, have the ability to install these emotions through pheromones or infrasound. There are of course other explanations for these feeling as being alone for such a period and combined with exhaustion can case hallucinations and panic attacks. The sightings of a big grey man’ some experts believe can be explained by the broken spectre illusion which, given the right atmospheric condition can cause the persons shadow to extend and seem to be cast out among the clouds. Can these reports be put down to exhaustion and hallucination? Maybe, but what about the footprints?